Martek, this has already been posted about here. Additionally, this topic would have better been posted in this thread, a thread that you created. Making a new thread was unnecessary. Remember the forum rules when posting. No offense, but you need to chill out on your "Moderation" okay. You keep telling people the same thing. Big deal okay. I've been a moderator too and one thing I've learned on forums is it is difficult to keep track on certain things. This is a comets thread, congratulations, but I was talking about Mars being hit by a comet which is better off in another thread. So if you please, do not go telling me what I can and can not post, also don't remove relevant topics as I noticed its not there anymore. I don't care if you're a moderator you don't have power over me or anyone in here because the powers you think you have are making you look really bad. Again, i've been a moderator before and the one thing I was sick of was seeing other moderators take moderation to a whole new level. I'm almost 30 years old, I'm not some kid okay. Do not and I repeat this again, do NOT tell me what to do in here. I am old enough to know what should be posted. I'm not going to post the Mars comet collision article in a "comet thread" because to me that would be on the lines of hijacking a thread. 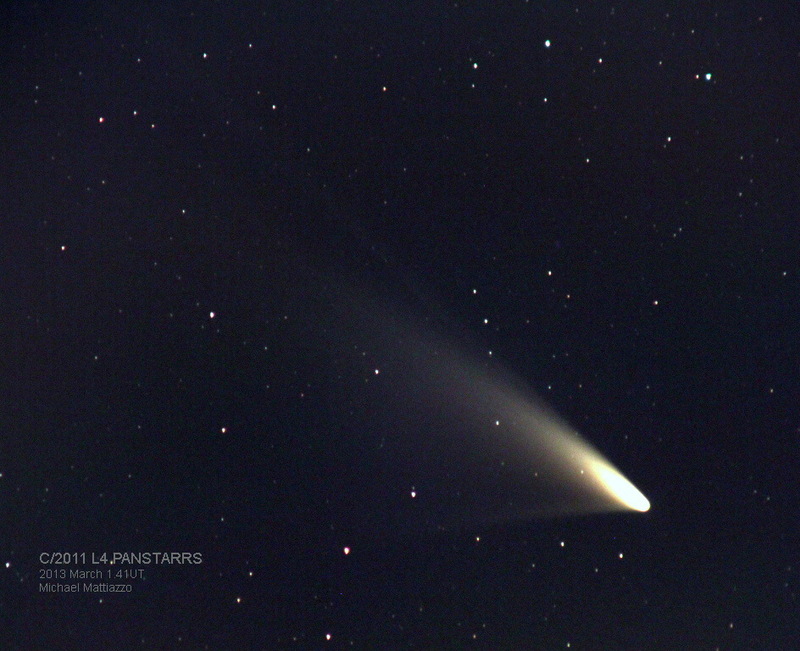 Right now this comet thread is good for Panstarrs, ISON, and Lemmon. That is the topic in here so the right thing to do is to create a new thread about a new event regardless if its a comet in 2014 it still is about Mars and the collision. I don't want your reply telling me how you're going to be right because you're not going to strong arm me. I came to you just now and here with legit reasons why I want you to back off myself and other people about "rules" because last I checked its confusing as hell to post multiple things in one single thread. This is a comets thread, congratulations, but I was talking about Mars being hit by a comet which is better off in another thread. You are talking about a comet which MIGHT impact Mars, but most likely will not. The main focus is on the comet. If it turns out that in the future the comet will hit Mars, then it can be moved elsewhere. But for now it is most appropriate here. Additionally, it was already being discussed here by others, meaning that whether you think that this was the most appropriate thread to post it in or not is irrelevant since it was already here. don't remove relevant topics as I noticed its not there anymore. I didn't "remove" anything. Your thread was merged with this one, your post still exists here. its confusing as hell to post multiple things in one single thread. It's even more confusing to have a different thread for every slightly different topic. That's why the current system exists like it does. Everyone was posting everything in new threads, and the forum was quickly becoming innavigable. So the system of keeping everything of a similar topic in one thread was implemented, and it has helped a lot in preventing the forum from being harder to navigate. If a thread becomes too big, or if a particular discussion takes off in a thread, then it can be split into its own thread. But to start with things should be in a few places as is reasonably possible. That is the topic in here so the right thing to do is to create a new thread about a new event regardless if its a comet in 2014 it still is about Mars and the collision. The topic in here is comets. You're talking about a comet, specifically C/2013 A1. This comet conincidentally has a very very small chance of hitting Mars. Far more likely it will just have very minor effects on the planet and put on a pretty show. Talking about hypothetical comet or asteroid impacts should be in comet or asteroid threads until such time as an impact does or will actually occur. Thus far the relevant discussion about this object belongs here. I'm not the only person who thinks so since other people brought up the discussion here first. I'm almost 30 years old, I'm not some kid okay. I never said you were, and it would not matter to me whether you were 16 or 60. The only thing that is relevant is your conduct, not your age. on forums is it is difficult to keep track on certain things. We are endeavoring to make it easier on this forum, and doing so by reducing the number of redundant, irrelevant, or short-lived threads. As I said before, it has made a big difference. Do not and I repeat this again, do NOT tell me what to do in here. That's kind of funny considering the number of demands you just made of me! The bottom line is this: this forum has rules and guidelines. Participation on this forum means agreeing to abide by those rules and guidelines. I did not create these rules, they existed long before I was here. I was specifically asked by the administration of this forum to moderate it, to make sure people are aware of and abide by the rules. When they behave in a way that falls outside the rules and guidelines, then I have to tell them what they did and what they should have done. That is my job. You can of course say and do whatever you want, and you don't have to listen to me, but if in the process of doing things your way you were to continually flout the rules with your posts then you would eventually lose your privilege of posting on this forum. Thanks, but this is TL&DR material. I asked for no reply simply because after my post I would have lost interest and gotten over the subject. I get some of what you're saying though but I still think it was a stand alone discussion to open up a new thread and start discussing. It had more to do with it then a comet hitting Mars. This could evolve into a great discussion of possibly if it hit it could teraform the Red Planet. But like I said, im over it. Thanks. This could evolve into a great discussion of possibly if it hit it could teraform the Red Planet. No it could not. Large impact events like this actually cause depletion of the atmosphere, and probably contributed in large part to stripping away its atmosphere in the past. Also, the dust shroud kicked up around the planet would lead to a cooling effect. Actually, yes it can. It can thicken the atmosphere enough and kick up a lot of vapor to change the climate on Mars forever. It could very well do that and there is evidence that suggests that it can thicken Martian atmosphere and after the dust settles the planet may warm itself up. I'd take you serious, but i've seen you wrong so many times on this forum I lost count. One major thing I remembered you were wrong at was when someone mentioned NASA to bring an asteroid to Earth by 2025 and you said even if that asteroid hit Earth it would burn up in the atmosphere and not harm people. Then the Russian meteor proved you wrong when the SUV size asteroid (which is about a good size for Nasa to bring back to Earth) slammed into Russia and injured over 1000 people but hey you said it would burn up and be harmless to people. You were wrong. It hurt people and caused harm. But I digress, the planet can easily have an extreme favorable change in the environment if it was struck by a 30 Mile wide piece of rock (the comet) which again is enough to over time dramatically change the planet. No one knows what would really happen but the possibility of it happening is still there. You saying "It could not" is completely wrong. There is always a chance for anything. have you witnessed a comet that size smashing into Mars? No? Okay then. So an appropriate answer would be to reserve possibility it could happen. You're right, it would be a cooling effect, but what happens after that is what I am talking about. Earth went through the same thing when the asteroid killed off the Dinosaurs. It cooled down, and over time, changed the entire planet forever. Nothing is impossible, so the answer is "Yes, it could happen"
If you want to talk about stripping away an atmosphere then you could explain to me why Earth still has an atmosphere after the large meteor impact occurred that wiped out the dinosaurs? If you want to get technical, Mars acquired its thin atmosphere because of the very weak Magnetism it has. Unlike Earth, Mars is not safe from the Sun's radiation and the components in the atmosphere are hurled into space. Lastly, another theory is that the Universe is Expanding... true? Yes, very true. So is it the continents spreading apart or is it actually the Earth expanding and separating the land masses? Like I said, anything is possible. I rest my case. Good day. "a comet strike on Mars could jumpstart terraforming efforts by delivering a big load of volatiles (water, methane, CO2 and so on), plus a lot of heat energy that could release water and other volatiles from the martian soil." i've seen you wrong so many times on this forum I lost count. Cite specific example please. i.e. links. I don't think so, please go check again. One major thing I remembered you were wrong at was when someone mentioned NASA to bring an asteroid to Earth by 2025 and you said even if that asteroid hit Earth it would burn up in the atmosphere and not harm people. Then the Russian meteor proved you wrong when the SUV size asteroid (which is about a good size for Nasa to bring back to Earth) slammed into Russia and injured over 1000 people but hey you said it would burn up and be harmless to people. Do you even check these things before you type them? The Russia meteor was not SUV sized, it was 17 meters wide - the size of a house. I have never said and would never say that that would not cause damage on Earth. And yet it did burn up in the atmosphere, only small fragments made it to the ground. Regarding that example you're citing, I can't say for sure without knowing exactly where I said that at, but I was almost certainly talking about an asteroid/meteoroid between 1 and 10 meters across, which would most certainly never penetrate Earth's atmosphere. One 8 meters wide did hit Earth a few years ago over Sudan and caused no damage. Unlike Earth, Mars is not safe from the Sun's radiation and the components in the atmosphere are hurled into space. As has been discussed in the Mars thread, this sputtering effect that you're talking about is not the only and even not the primary means by which Mars has been losing atmosphere. See that thread for more discussion on that. ...are you referring to the Expanding Earth hypothesis? If so, then that discussion has already been going on in the Conspiracy Theory thread and you can go into it more there. There is always a chance for anything. No there isn't. There are some things which are just absolutely impossible, and you can observe an infinity of occurrences of that situation and never see some results happen. Because Earth is more massive, and because an impact of that size would not cause atmospheric mass loss. The event(s) on Mars that may have contributed to mass loss were many orders of magnitude larger. It could very well do that and there is evidence that suggests that it can thicken Martian atmosphere and after the dust settles the planet may warm itself up. Even if 10% of the mass of the comet were to wind up as a permanent part of the atmopshere - which is EXTREMELY unlikely - then the atmosphere would only thicken by ~20%. This would not cause a radical change in the Martian climate, certainly not enough to cause any terraforming effects. All of these are already on Mars in much greater quantities than any comet strike could deliver. plus a lot of heat energy that could release water and other volatiles from the martian soil. Only if it hit just the right place in just the right way, and even then the global cooling that would result from this impact would cause these volatiles to freeze right back into the ground. In the future, if you take issue with something that someone says, or want to dispute a conclusion that someone has drawn or a fact that someone has presented, then either use a quote if it was in the same thread, or provide a link if it was in a different thread so that everyone is on the same page and there are no misunderstandings. This is a necessary foundation for orderly and rational discussion. I love all of these pics anyway. Just a bit of waiting and I will visit them in SE 0.97 ! Yes, well it'll probably rain next week. This is the first week we had some good weather down here since octobre or so. It always gets cloudy, even now, the clear sky remained only for a few hours as I see thin clouds already filling the sky. I know, what you mean. Here in west-germany it's the same. There are clouds coming from south right at the moment. Nevertheless I hope I can use the telescope in the next weeks, because spring isn't far away anymore. Really hope I get to see another one.